October 3, 2016 – This week, our time machine has a familiar face in the passenger seat. It’s Paul Kahan, who joined us previously to discuss The Bank War: Andrew Jackson, Nicholas Biddle, and the Fight for American Finance. You can catch that interview at History Author.com or wherever you’re listening now, and you enjoy the video we produced illustrating the political and journalistic changes occurring at the time of the Bank War. 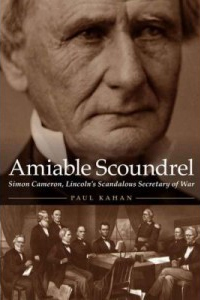 Paul joins us again to discuss his latest work, Amiable Scoundrel: Simon Cameron, Lincoln’s Scandalous Secretary of War . From abject poverty to undisputed political boss of Pennsylvania — no easy feat in the notoriously fractious Keystone State — Simon Cameron served as senator, and ultimately Abraham Lincoln’s Secretary of War as the nation tore itself apart over slavery, at the outset of the Civil War. You can visit this week’s guest at PaulKahan.com, or follow him on Twitter @Paul_Kahan, and check out his subject at the The John Harris – Simon Cameron Mansion in Harrisburg, PA. Copyright © 2019 History Author Show. All Rights Reserved. H5F theme music provided by Jobro through a Creative Commons License.